Yesterday, we got U-Verse installed at our house. It took about 6 hours from start to finish since they had to run new cables and figure out some issues. So basically I couldn't watch football or use the internet for 6 hours, but I had to be home. Bored, I decided to make a crockpot of soup. I was originally thinking chili but I had the ingredients for tortilla soup on hand. Combine all ingredients in a large crock pot (I used my 6 qt and had plenty of room), starting with soups, tomatoes and stock, stir until well mixed and add in vegetables, beans and garlic. Add chicken, cumin and chili powder. Cook on high for 2 hours. Taste and add cayenne pepper if desired. Reduce heat to low and cook an additional 2 hours. Add shredded cheese and stir until cheese is melted. Brown tortillas in a small skillet with a small amount of oil, sprinkle with garlic salt (I use Lawry's) and cut into small pieces. 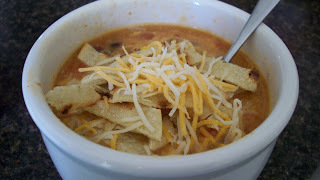 Ladle soup into bowls and top with tortilla strips or crushed chips and more cheese if desired. This caught my eye and I made it yesterday - it was fantastic! Definitely going to make it again. Thank you for this recipe! I stumbled on your blog through Pinterest and have already made this soup twice. We love it! Even my little ones couldn't get enough of it tonight. OMG, this is fantastic! I was looking for a recipe for my leftover rotisserie chicken and decided to go with this; I'm so glad I did! I added a pinch (or 2) of cilantro and topped with a bit of sour cream. Mmmmm! Thank you for this great recipe.